When fresh berries are in season, make these mini fruit desserts. Kids love that they get their very own. Make dough: Preheat oven to 375 degree F. Whisk together flour, cornmeal, sugar, zest, baking powder, baking soda, and salt in a large bowl. With fingers or a pastry blender, cut in butter until mixture resembles coarse crumbs. Stir in cream just until mixture comes together. Gently knead in bowl just until it forms a dough. Make filling: In a large bowl whisk together flour, juice, and zest until smooth. Add 1 cup sugar and whisk until blended. Gently stir in berries to coat with sugar mixture. 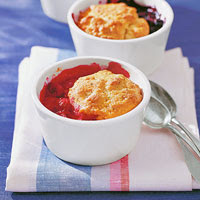 Divide berries evenly among 8 ramekins. Top each with 1/8 of dough. Sprinkle with 1/4 cup sugar and bake on a cookie sheet until berries are bubbling and top is golden brown and cooked through, about 25 minutes. Makes 8 servings. Calories 335, Total Fat 10.5 g, Saturated Fat 6 g, Cholesterol 33 mg, Sodium 179 mg, Carbohydrate 59 g, Fiber 6 g, Protein 4 g. Daily Values: Vitamin A 0%, Vitamin C 0%, Calcium 0%, Iron 0%. This entry was posted on 6:23 PM and is filed under Desserts . You can follow any responses to this entry through the RSS 2.0 feed. You can leave a response, or trackback from your own site.